The calendar below displays Empire Skate Club activities plus events organized by our friends in other inline and roller skating associations. Empire group skate leaders and event organizers: Please e-mail Robert S. in order to add your event to the calendar. Note that if you will be regularly organizing skates/events, we would be happy to arrange for you to have admin access to the calendar. Even if you do not join the Empire Skate Club, please be advised that Empire strongly recommends that all participants in Club-sponsored events (including its weekly group skates) should carry medical and liability insurance and should wear protective gear (including but not limited to a helmet, wrist guards, knee pads, elbow pads, and, at night, reflective clothing and blinking lights which are required by NY State law). Please also be advised that there are particular inherent risks of injury involved in city inline skating, including, but not limited to: cars, bicycles, other skaters, pedestrians, potholes, manhole covers, chains, train and trolley tracks, cobblestones, bad pavement, water, oil, debris, gravel, curbs, stairs, hills and inclines. This list of possible risks is not comprehensive, because conditions on the street, including the weather, are constantly changing. The Empire Skate Club cannot accept any liability for the existence of any such risks. Ultimately, each skater is responsible for staying alert to potential risks and obeying all traffic regulations. Finally, the Empire Skate Club strongly recommends that all participants in Club sponsored-events (including the group skates) possess and master a set of minimum skate skills before participating in its events: the ability to skate in control, especially on hills; to stop in traffic; to maneuver curbs; and to avoid obstacles. The 17th annual BIG APPLE ROLL ("BAR") is scheduled for August 1-4, 2019. BAR is an exciting four-day weekend of group skates, social events, and adventures exploring and experiencing New York City on skates. 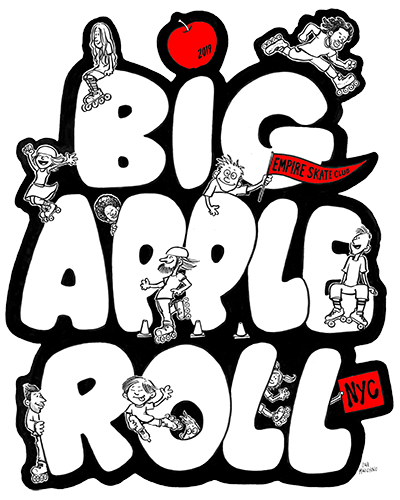 Read more about Big Apple Roll.